The High Five Returns October 19th With $977K in Prize Pools! It’s time to smoke the tables again! Americas Cardroom is rolling five days of big prize pools into one big tournament series. 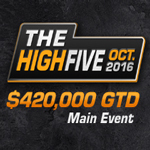 The High Five, a familiar series to frequent Americas Cardroom players, runs from October 19th-23rd and features $977,500 in guaranteed prize money! Furthermore and chief among the tournaments is a $420,000 guaranteed Main Event. The High Five runs from October 19th through the 23rd. The tournament offers up $977,500 in guaranteed prize money! The 5-day schedule features five tournaments per day, including No Limit Hold’em, PLO, Hyper Turbos, Rebuys, Knockouts, and others. Buy-ins start as low as $3. Once again, the Main Event features a $420,000 guaranteed prize pool on the final day of the series! In keeping with the 420 theme, the buy-in for the tournament is $420+35. Also back by popular demand is the famous “courtesy break” at 4:20pm ET on each day of the series. While $420,000 is guaranteed, the Main Event is likely to exceed expectations. Therefore those who have played at Americas Cardroom will recall that June’s High Five Main Event failed to cover, offering an overlay of about $5,000 and great value for those who played. However, thanks to the recent OSS Cub3d, and the buzz surrounding their upcoming real money product launch of Sit & Go 2.0, Americas Cardroom has grown its community by leaps and bounds.